Meanwhile… over in Spirit’s neighborhood, this via Astronomy Pic of the Day, Mars is in opposition! Yes, Mars is opposed today, even as the Moon is full. Explanation: Mars is at opposition tonight, opposite the Sun in planet Earth’s sky. Of course, it will be easy to spot because Mars appears close to tonight’s Full Moon, also opposite the Sun in Earth’s night sky in the constellation Cancer. For this opposition, Mars remains just over 99 million kilometers away, not a particularly close approach for the Red Planet. 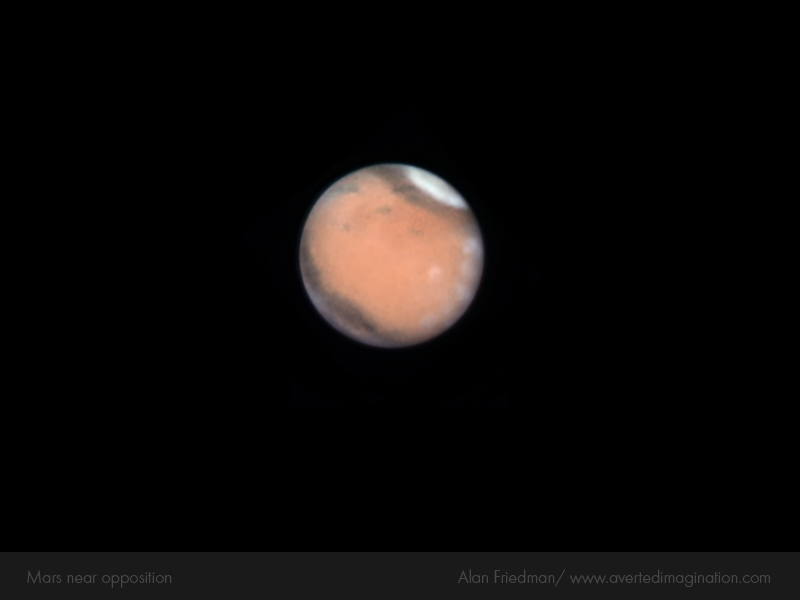 Still, this sharp view of Mars recorded on January 22nd is an example of the telescopic images possible in the coming days. The planet’s whitish north polar cap is at the upper right. Mars’ tiny red disk is about 14 arcseconds in angular diameter, less than 1/100th the diameter of the Full Moon. This entry was posted in Just Too Cool and tagged Mars. Bookmark the permalink. Whenever cool astronomical stuff happens, it always has to be overcast where I live. Sigh.